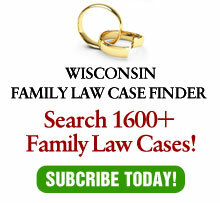 Usually, my column in the Wisconsin Law Journal is based on a new appellate case. On occasion, however, I get a request for a specific topic. Last week, the staff asked me to do a “Wish List” for family law. The article appeared in today’s on-line edition. It was fun writing it – let me know if you agree – or if you have better ideas.